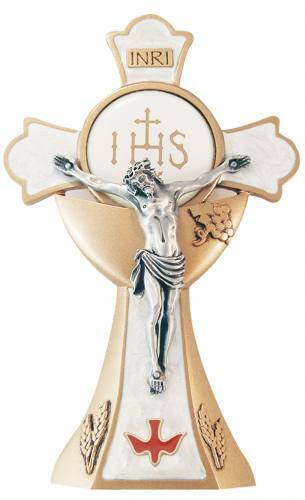 The Holy Mass Crucifix is part of an exciting Apostolate, the first of its kind in the history of the Church. This Holy Mass Crucifix is meant to remind those who look upon it of Christ's Sacrifice on the Cross, His Passion, Death and Resurrection, which is made present at each and every Holy Sacrifice of the Mass. In this way, even when not at Mass, the faithful may recall Christ's Sacrifice on the Cross and may recall their most recent Communion with Him in the Most Blessed Sacrament. With a St. Benedict medal on the reverse, this crucifix has the apostolic blessing of three popes (PP. Benedict XIV, Benedict XVI, & Francis) invoked upon it.